I’ve posted extensively here on the blog about how using essential oils can improve our lives. I turn to them on a regular basis for their positive impact on my health, mood, and overall wellbeing. But there’s another application for essential oils that tends to be overlooked, and that’s in cleaning! Many essential oils have antibacterial and antimicrobial properties, which makes them a great choice for cleaning your home in a way that is safe and natural. Lemon essential oil – Possesses antifungal and antiviral properties. Very effective at cutting through greasy and oily messes. Tea Tree essential oil – Possesses antibacterial, antiviral, and antifungal properties. An excellent choice for eliminating germs on often-handled surfaces, like doorknobs, countertops, computer mouses, etc. – especially around cold and flu season. Peppermint essential oil – demonstrated antibacterial and antiviral properties. It’s invigorating and stimulating scent make it a good choice for an all-purpose surface cleaner. 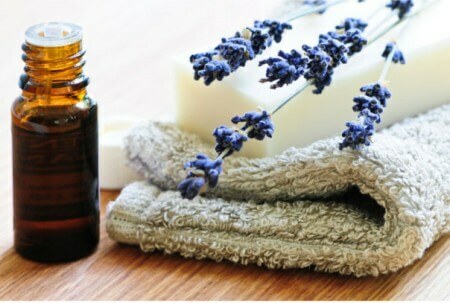 Lavender essential oil – demonstrated antimicrobial and anti fungal properties. An excellent choice for cleaning applications that involve fabrics or textiles, because of its’ relaxing, gentle scent. Defend essential oil blend – Also called the “Thieves” blend. Contains oils that possess strong antibacterial and antiviral properties. Like Tea Tree oil, it’s great for cleaning surfaces that have high concentrations of germs, or for diffusing to purify the air in your home. But before we talk about specific cleaners, there are a few good things to know about using essential oils in cleaning. Tip #1: Use glass whenever possible. Essential oils can degrade plastic containers, so a glass spray bottle is a better choice for using and storing cleaners that contain essential oils. My go-to method for storing my homemade cleaners is to store them in standard mason jars, and then attach a sprayer lid (like this one) when I’m ready to use it. Tip #2: Distilled water is the best choice for using in natural cleaners, as it carries essential oils most effectively. 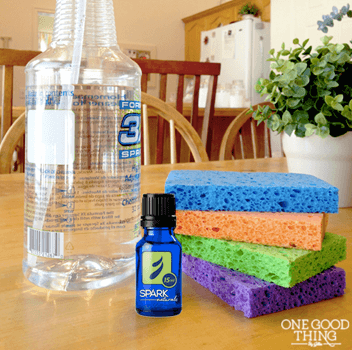 How do you use essential oils in your cleaning? What essential oils do I use? Have a question about essential oils? Curious about what brand of essential oils I prefer? Find the answers in my Essential Oils FAQ! DIY “Warming Salve” For Cold Fingers & Toes! I have already received my cleaning kit from Sparks but I don’t know how to mix it or what I need to mix it with or how to use it. Can you help me? I also find the scent of tea tree oil a bit overwhelming. I use GSE in place of it in some of my cleaning products formulas. These oils are a good, natural way to go but the scents of some of these will gag you! Melaleuca? Yuk! You will have to fumigate after using this one! I grow the basic thyme, basil, etc. The plants always produce many times the amount I could use in cooking. Last year I cut the thyme and stuffed it in canning jars, a quick seal and left it. I then open, strain and make a cleaning spray with the infused water. Leaves a nice clean smell. It is ugly in the spray bottle because the color is usually brownish but it works.